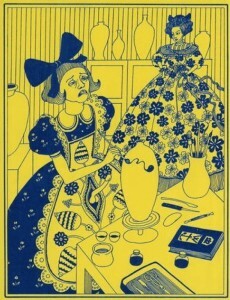 Grayson Perry is an English artist, known mainly for his ceramic vases but works in several media. Perry’s vases have classical forms and are decorated in bright colours, depicting subjects at odds with their attractive appearance, e.g. child abuse and sado-masochism. There is a strong autobiographical element in his work, in which images of Perry as “Claire”, his female alter-ego, often appear. He was awarded the Turner Prize in 2003 for his ceramics, receiving the prize dressed as Claire. He lives in London and Sussex with his wife, the author and psychotherapist, Philippa Perry and their daughter Flo.